By Father John Murray, C.Ss.R. In January 1857, three American-born Redemptorists, Isaac Hecker, Nathaniel Hewitt, and Francis Baker, preached a mission in the cathedral of St. Augustine, Fla. After closing the mission, the fathers traveled to the cathedral in Charleston, S.C., to join their confreres, Clarence Walworth and George Deshon, who had already opened a mission there. The next Redemptorist mission in Charleston was given in 1863, the third year of the Civil War. Father Giles Smulders, a Confederate Army chaplain, conducted the services during the siege of the city by federal troops. In March 1930, Bishop Emmet Walsh of Charleston invited the Redemptorists to establish a foundation in Orangeburg. 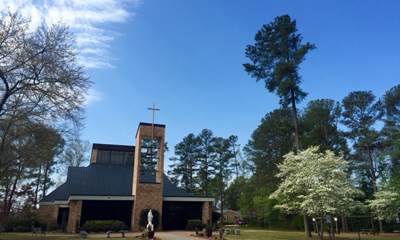 Redemptorists have served at Our Lady of the Hills Church in Columbia, S.C., since 2015. For more than 85 years Redemptorist missionaries have been involved throughout the diocese in an array of apostolic activities: Providing ministerial care to African-American communities, speaking out against racial discrimination during segregation, visiting prisoner-of-war camps, preaching missions from trailer chapels, conducting open-air missions, and establishing missions, schools, and parishes. Then in 2015, the bishop of Charleston, Bishop Robert E. Guglielmone, asked the Vice Province of Richmond for assistance in staffing a parish in Columbia, S.C. Since the members had recently voted to take on a new venture, this seemed like a good idea. On August 1, 2015, the Feast of St. Alphonsus, Father Peter Sousa, C.Ss.R., and Father John Murray, C.Ss.R., began their new ministry at Our Lady of the Hills Church in Columbia. Before going any further, I would like to describe what our parish is like. There are approximately 1,600 families registered in the parish. Our parish is quite diversified, with people coming to worship from all over the world. Approximately 30 percent of our community is Hispanic, and of the 500 children in religious education last year, half are Hispanic. Our youth group has about 65 young people coming on a regular basis, and 77 young people were confirmed in May. In other words, our parish is very active. What is our life and ministry like at Our Lady of the Hills Parish? Unfortunately, our rectory was designed for a diocesan priest, so we are without a chapel in the rectory. We have morning prayer and meditation in the church, and during daily Mass one of us is the main celebrant while the other concelebrates. I would like to describe a few of the ministries at OLH Parish that seem to define us as a Redemptorist missionary parish. The Hispanic community is the fastest-growing group in the parish. During this last Easter vigil 22 young Hispanic children were baptized and confirmed. 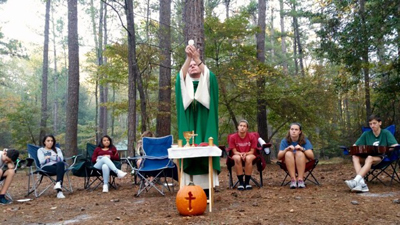 Father John Murray celebrates Mass for youth at the camp where they meet. On the weekends we have six Masses, including one Hispanic Mass that is standing room only and one bilingual Mass. Every Thursday evening Father Peter hears confessions for the Hispanic community for three hours. However, history has a way of repeating itself, and some of our own parishioners are uncomfortable with the Hispanic community. Some have even threatened to leave the parish merely because they are different. As members of the Hispanic community continue to be threatened by ICE, we have other groups in our parish seeking a safe place to live. We have a number of Catholics from Iraq and Syria who have come to us for assistance in seeking refuge from persecution. We have written letters to the government on their behalf and had petitions signed for them. Truly they are the poor and abandoned. In the Columbia area there are 11 correctional institutions. On a regular basis I go to one of the maximum-security prisons with a deacon from our parish to say Mass and hear confessions. The inmates we visit are deeply appreciative that we would take the time to be with them—to share the Good News and remind them they are not forgotten and that God has an infinite love for them. Since arriving at OLH, Father Peter and I have been very involved in ministering to the youth of the diocese. In the Diocese of Charleston there is a team of high school young people who come together on weekends throughout the year to plan diocesan youth activities. At the camp where the young people gather to make their plans, Father Peter or I will go and celebrate Sunday Mass and hear confessions. No one else is available to say Mass and hear confessions for the young people. Columbia is in the center of South Carolina, and all the major roads seem to intersect there. I believe that is why our parish center is so large and offers so much. Our parish is in a central location, so people from all over the state can come and use the facility. Our parish center is equipped with 13 classrooms, a gym, showers, a dining room, and a full kitchen. Every month we host the Diocesan Diaconate Formation Program in our Family Life Center, but we are not involved in the program. We also host Cursillo for the entire Diocese of Charleston four times a year. We are very much involved in Cursillo, saying Mass, hearing confessions, and just being available. It is a blessing that we are here to help out on Cursillo weekends. Other clergy have been reluctant to help out for various reasons. Finally, I’ve hardly mentioned our many active parish ministries. But in keeping with the Redemptorist charism, I would like to mention two specific ministries. Every month a group of parishioners prepares more than one thousand sandwiches that are brought to a homeless shelter in downtown Columbia to feed the poor. On a regular basis another group of parishioners washes the clothes of the homeless at a homeless shelter.